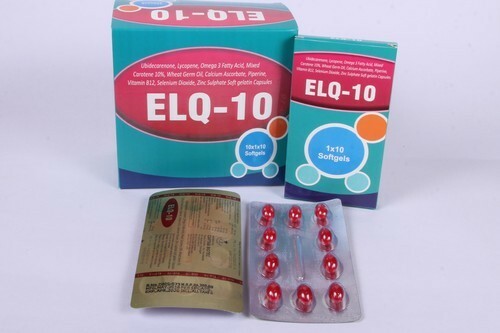 Our enterprise is actively engaged in manufacturing optimum quality ELQ-10 Capsules. Founded in the year 2006, at Chandigarh (India), We “Captab” are a Sole Proprietorship firm, engaged in manufacturing the best quality range of Pharmaceutical Injections, Pharmaceutical Tablets, Pharmaceutical Capsules, etc. We also impart highly reliable Pharma Franchises In Uttar Pradesh, Pharma PCD In Uttarakhand, Pharma PCD In Himachal Pradesh, Pharma PCD In Bihar, Pharma PCD In Gujarat, etc. We are offering a wide range of pharmaceutical drugs meant for prevention and treatment of different health disorders. Our dedication and quality has made us to earn a prominent position in our domain. We still are on the path making countless efforts so that our wide array of products meet the standards laid by health and medical organizations. Our team holds vast understanding of the industry which makes them to comprehend the exact demand of our clients. Backed by the assistance of our mentor "Deepak Sharma”, we have been able to provide maximum satisfaction to our clients.